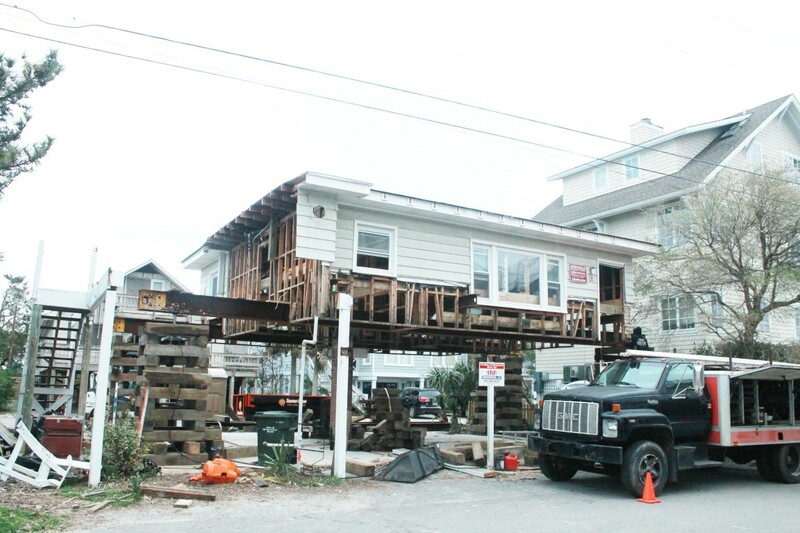 The house at 9 Water St. was elevated 11 feet off the ground and funded by a grant from FEMA. 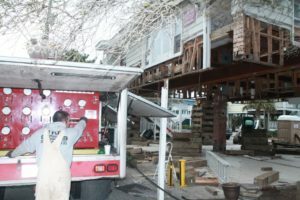 With Hurricane Florence in the rear view mirror, but worries about the damage the next storm could do, construction workers last week used a latticework of wooden pilings and steel beams to elevate a house on the Wrightsville Beach south end. The project, funded by the Federal Emergency Management Agency, will help prevent future losses, and possibly help Wrightsville Beach’s flood insurance rates. Richard Marks, of TKF House Movers, uses a unified jacking machine to raise the house at 9 Water St. in Wrightsville Beach. FEMA is paying nearly $170,000 to elevate the house at 9 Water Street, which is one of three houses on the island that qualified for the grant, but the owners were the only ones to accept the grant and raise the house. To qualify for the FEMA grant, the house has to have suffered from repetitive losses from prior storms or flooding events. The houses eligible for the grant are identified by FEMA, said Tony Wilson, Wrightsville Beach planning and parks director, which then notifies the town about the grant. Elevating flood-prone homes out of the floodplain can have an overall positive effect on the town’s insurance rate, said John Buechele, of the Buechele Building Group, which oversaw the project on the house. The Buechele Building Group has made a specialty out of elevating houses out of the flood plain, raising three in Carolina Beach last year and with two more planned for houses on Bald Head Island. And while two other houses in Wrightsville Beach were identified by FEMA for the grant, neither owner signed up for the program, Town Manager Tim Owens said, adding that owners can have different reasons for not wanting to elevate the house. However, the project on Water Street is different than the project at 5 W. Fayetteville St., which is also being raised. However, that house was already out of the flood zone, and is being elevated so that additional two additional stories can be added underneath what was once a single story house. The Buechele Building Group will be adding a second floor to the Water Street house, as it did with a house in Carolina Beach as well. The project will take months to complete, Buechele said. Elevating a house also allows more extensive remodeling of the structure. Currently, structure that’s not conforming to current ordinance can only have up to 50 percent of its floor space remodeled without having to comply with new requirements. However, elevating the house allows for more remodeling, since the structure will now comply with the elevation requirements, Buechele said. But Buechele said that most importantly, elevating a house in a floodplain can protect owners from what will likely be higher insurance rates in the future.